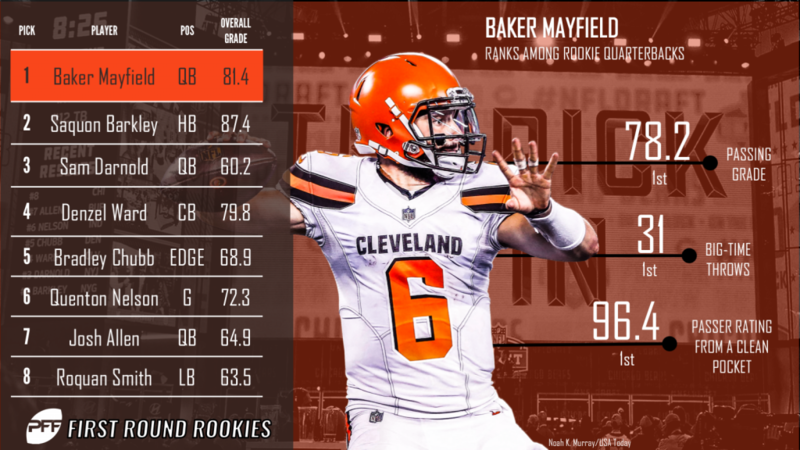 Week 15 of the NFL regular season schedule has been completed, giving us an even larger sample size to delve into just how each of the 2018 NFL Draft first-round picks has fared in their respective action so far. Some of the 32 first-rounders have not qualified for a grade either based on small snap counts or not playing altogether. On the other hand, some players have jumped out of the screen and have helped strengthen their teams. Mayfield started the game off well with a beautifully thrown corner route for a touchdown on his team’s opening drive. However, his accuracy waned for the remainder of the first half, which led to a red-zone interception at the end of the second quarter. He turned it around enough in the second half to lead the Browns to the lead late in the game, and he ended the game having completed 18-of-31 attempts for 188 yards, two touchdowns, an interception and a passing grade of 57.9, which was his lowest mark since Week 9. Along with the rest of the Giants’ offense, Saquon Barkley was shut out in Week 15. Barkley managed just 31 rushing yards (his lowest figure since Week 2) on his 14 carries, but there were still flashes, as he still managed to produce a breakaway run and three forced missed tackles on the afternoon. Sam Darnold’s best performance to date should excite Jets fans for the future. The Jets may not be making the playoffs in 2018, but as they look beyond the season, this performance by the third overall selection in the 2018 NFL Draft is something for the fanbase to get excited about. Darnold was excellent on throws traveling between 10 and 19 yards downfield, going eight-for-11 for 137 yards with two touchdowns and no interceptions. He ended the game with an overall grade of 90.3, which is his best single-game mark to date. Ward’s play has been nothing short of inspiring this year, and it seemed like Deshaun Watson took notice of that before his Week 13 game. After seeing a whopping 16 total targets over his previous two games, Ward was targeted just once in his Week 13 clash and allowed just two yards on the catch. Through 13 weeks, Ward allowed a passer rating of just 70.0 on throws into his primary coverage – the 11th-best mark among all players at the position in that span. Once again, Chubb was productive for his team in the pass-rush and added another three pressures from his 28 pass-rushing snaps against the Browns in Week 15. This takes his season total to 53 total pressures on the year – the most by a rookie edge defender this year and just 12 shy of setting the PFF record for the most pressures ever recorded by a rookie edge player at the position.